Continuity mistake: The Galactica can retract her launch bay pods into the hull. She is shown doing it just before her first FTL jump. The instant before she jumps, the pods are suddenly shown in the extended position again. 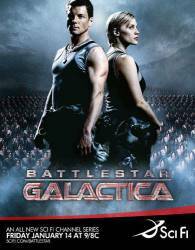 Other mistake: In the CIC, Tigh challenges Apollo and asks why he isn't in the brig. Shortly after Apollo begins to explain the plan for the search and rescue of the Raptor downed on Kobol. He refers to it as "Raptor 3" when it is Raptor 1 they are looking for. Raptor 3 was destroyed when they first jumped to Kobol, Raptor 2 escaped back to Galactica, and 1 fell to Kobol. The Raptor on Kobol is referred to as Raptor 1 throughout the rest of the episode and on preceding episodes. Revealing mistake: When Billy lies dead in the morgue and the President fixes his hair while saying, "That's better." we can see Billy's throat move as he swallows. Continuity mistake: Season 1 Episode 11 "Colonial Day" Helo has been on Cylon-occupied Caprica for 47 days. Why is his haircut exactly the same as when he was stranded? Continuity mistake: Episode 2-13, 'Epiphanies': When Baltar is led by the wrist along a corridor by Number Six, two crewmen pass Baltar on his left, headed the other way. 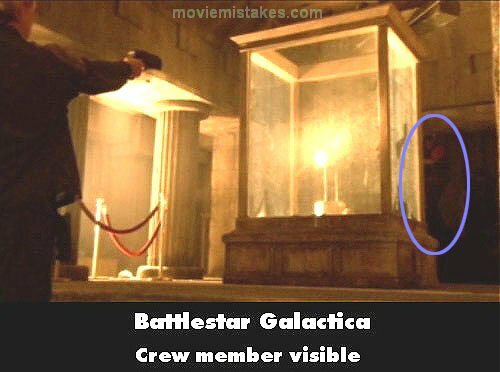 The shot from behind Baltar places the crewmen immediately to Baltar's left when the shot is cut to a shot looking in the opposite direction as Baltar approaches the camera and the crewmen are now far behind Baltar, instantly. He is speaking continuously before and after this shot change, so there is no 'time passage' between the shots. Continuity mistake: 320 "Crossroads, Pt. 2" and 401 "He That Believeth in Me": When Starbuck returns in the season 3 finale, the side of her Viper has no nameplate on it. However, during the season 4 premiere, the nameplate with "Kara Thrace 'Starbuck'" has returned, though only a moment later. Continuity mistake: 401 "He That Believeth in Me": In the season 3 finale, Anders has a very noticeable limp, especially seen when he's following the Chief to the hangar deck, However, in the season 4 premiere, even though the same day, he has no limp at all. Continuity mistake: When the President is lying on the couch, she starts coughing and covers her mouth with her right hand, however, as Adama hands over a glass of water she is now covering her mouth with her left hand. Continuity mistake: When the President is getting ready for her speech there is a pencil lying on the table in front of Adama. When it cuts to the President picking it up it has changed position on the table.